Leopold Godowsky: Symphonic Metamorphoses of Themes from "Schatz-Walzer"
Fantasy for Piano in C Major, D 760/Op. 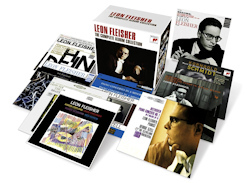 15 "Wanderer"
Leon Fleisher is one of the finest pianists of the past century. His story is tragic. At age ten he was taught by Artur Schnabel, who did not usually teach children, and an international career was launched by his first prize in the Queen Elizabeth Competition in Brussels. But then, like Robert Schumann, he lost the use of a hand and did not regain it for three decades. His good left hand, however, enabled him to play a number of works written for the left hand only, including some commissioned by Paul Wittgenstein, the brother of the philosopher Ludwig Wittgenstein, who lost the use of his right hand in the First World War. Fortunately, Fleisher also had talents as a conductor, as administrator (Tanglewood and Aspen), and gave master classes, attracting students worldwide. The present collection of Columbia/Epic/Sony recordings includes the many works listed above but not include his late album Two Hands (on another label) with one of Schubert's greatest sonatas, as well as pieces by Bach, Chopin, and Debussy. My own acquaintance with Fleisher's playing goes back many years, most notably to his recordings of the Brahms concertos and Handel Variations, which I believe are unsurpassed. Eugene Istomen's performance of the Handel Variations would no doubt be competitive with Fleischman's but not the one by Emmanuel Ax. What is most impressive about Fleischman's playing generally is the clarity of his articulation of phrasing. For anyone by chance unfamiliar with his playing I would especially recommend those Handel Variations by Brahms. The five Beethoven piano concertos as Fleischman has recorded them with George Szell and the Cleveland Orchestra leave nothing to be desired. This pianist and conductor worked particularly well together. Their tempos are very well chosen. And they make the slow movement of the second Beethoven concerto, always my least favorite, more beautiful than I ever realized. One of the happiest groupings of works by other composers are the left-hand concertos by Ravel, Britten, and Prokofiev. His Ravel is surpassed by the superb performance by Robert Casadesus, but this is good. Early in his career Fleischman championed the works of other twentieth-century composers, such as Korngold, Copland and others. It is good to have these here. The disc with Copland also includes works by Sessions, Kirchner (who studied with Schonberg) and Rorem, who wrote all those memoirs. Jed Distler's essay connects Fleisher's interpretations of Liszt and Mozart to Schnabel's influence. Clarity is their hallmark, I would say. The Rachmaninoff, a work I can hardly listen to owing to gross overindulgence in it in my youth, is not, perhaps happily, a full blown romantic interpretation. I was also carried away by the Grieg in those days, following a high school production of Song of Norway, but I can still find it beautiful as well as impassioned. I am glad that after years of palate-cleansing from hyper-romanticism through leaner and more pungent works of the twentieth century, I can listen to most of the music here with pleasure again. All in all, this is a collection to be treasured.